Since the reports publication the UK government has been, at least in the official meetings, not expressing a need to reduce the number of goals and targets. This looks like it will change again now with the governments response to the Audit Committees Report. What has been clear to many people associated with the negotiations is that far from being interested in a set of Sustainable Development Goals the UK has been pushing a more MDG+ agenda and the outcomes from the High Level panel Report which UK Prime Minister co-chaired. As has become more and more clear since none of the other countries that were co-chairing the High Level Panel Report are arguing for less goals. So what does the response of the UK government actually say? "The UK Government has repeatedly stated its support for the breadth of the content of the Open Working Group report. However a framework of 17 goals and 169 targets is not implementable for either the UK or for developing countries, and will not drive the action we need to see on poverty eradication or sustainable development. The power of the MDGs was in their simplicity and in their ability to be implemented. It is precisely because the UK wants to build support for ambitious action that we support a shorter, fully implementable list of goals and targets and as intergovernmental negotiations progress through 2015 the UK will continue arguing for a framework that is workable and implemented by all Member States." Virtually all governments do not want to re-open the discussion on goals and targets if the UK do infact push for this it is difficult to see how they can do it as the European Union is negotiating on behalf of the Union. Perhaps we will see a national statement to the effect of the above but this will be seen by many people as a destructive action. No one is completely happy with the goal and targets but they hide some very important developments in areas of SRHR and governance that could be lost by the UK 'going rogue'. The next meeting will look at the 'technical proofing' of the targets and as we now know there 'were' two versions of this being undertaken. One which was a very substantive re-looking at the targets reclassifying some as indicators and others merging. The second is the 'proofing light' version which really looks for consistency between international agreements with suggestions on some slight changes so government commitments in one fora and the same in the SDGs. The first version leaked out at the January Post 2015 meeting and was appropriately slammed by developed and developing countries alike. One has to wonder if the UKs hands were working behind the scenes on this. There is a small hope that they might use the UN Secretary Generals six themes as the opportunity not to lose face or cause serious problems for the negotiations. I really hope they focus on them and the Declaration as the mechanism to offer a window to clustering the goals. The UN SGs six themes got a far showing at the last meeting of the Post 2015 negotiations. I like them myself though you did hear other suggestions such as People, Planet and Prosperity - the slogan from the 2002 World Summit on Sustainable Development. I expect the BIG discussion this month to be on indicators. The Statistical Division have done excellent work of putting forward some suggestions on indicators to support the targets. They have given the rational for the ones they have suggested. The big question will be will the negotiators after having had their say let the statistical people do their job. 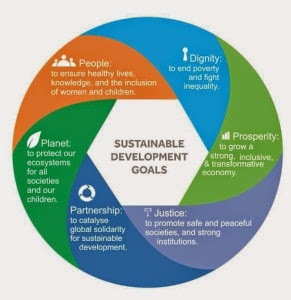 If the Inter-Agency Expert Group on Sustainable Development Goal indicators is set up this week then the timetable for its work at present is to have a proposal indicator framework to be ready by July 1st and by the end of 2015 for the Group too have an update on the indicator framework to input to the Statistical Commission in February 2015. The reality of the UN is that whatever comes out of the Statistical Commission in 2015 has to still be finalized by the UNGA at the end of 2016. Most countries will already be assuming what they have to do by the end of 2015 based on their work. I have for a long time been arguing we need a UN Data like UN Water, UN Energy and UN Oceans to bring the system together with stakeholders to ensures a coherent approach moving beyond 2016. A similar suggestion as made in the UN SGs synthesis report in December. The discussion last week was of bringing together all data producers into a Forum for Development of Data. However the final approach looks most people are thinking along the same lines. Last weeks pre-meetings of the Statistical Commission were full of stakeholders. As one Statistical Commission member said - "last year we had only one NGO attending - now we are the rock stars." "The UK supports visible integration of climate and environment across the post-2015 framework. Tackling climate change, promoting good governance and eradicating poverty are inextricably linked. The post-2015 development framework should complement and support—but not duplicate—international climate negotiations already underway. The framework must therefore include measures to fully and visibly integrate climate change action, including: ambitious, climate-resilient goals and targets on areas such as energy, water, agriculture, oceans, deforestation, disaster resilience, natural resource management, and others as relevant; the 'below 2 degrees' objective; and a strong framing narrative on the importance of addressing climate change." It seems even the climate goal is being challenged by the UK - this might have been an ok position last March but in 2015 as we are moving towards a final agreement this is not helpful. As a Brit i miss the good old days under the leadership of John Gummer (environment) and Lynda Chalker (development) in the Conservative government of the 1990s and Michael Meacher (environment) and Clare Short (Development) under Labour when DFID and the UK Department for Environment Transport and the Regions was a constructive team player. The UK parliament will be dissolved just after the next discussion on the SDGs on the 30th of March and a new government elected on May the 7th. NGOs are briefing opposition parties which are probably going to win the next election to ensure on may the 8th we at last have a constructive engagement by the UK government in this process and in the FfD process as well.